Backed by more than three decades of professional excellence, Qinqin Liu continues to pursue her goal of transforming complex science into simplified and informative art. The combination of art and science suits Dr. Liu well, as she was introduced to both at an early age by her father and she finds the thought processes to be much the same. Her work focuses on shared ecosystems and living environments related to changing climates and human health. Although she maintains positions as a senior environmental scientist with the Department of Water Resources for the State of California and the climate change project team manager for the Water-Energy-Food Nexus of the same department, Dr. Liu is now more concentrated on her art. Her work as a biologist and environmental scientist gave her a unique perspective on the beauty of nature, which serves as her inspiration. 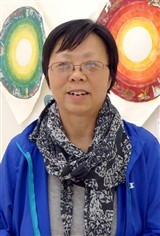 Most recently, Dr. Liu was a guest artist at the Art Center at Yosemite National Park, an exhibitor at the Open Studios Show at the School of Visual Arts in New York, a featured artist in SciArt Magazine by SciArt in America, and an exhibitor at the Global Art-Science Environmental & Sustainability GASES Network. She was also a part of exhibits at museums, galleries, corporations and conferences, and created the book cover for “Green Career.” Her work is included in numerous private collections. When Dr. Liu has free time, she enjoys lending her talents to her community. She has been an art docent for the San Juan Unified School District, a member of the steering committee for the International Olympic Sculpture Art Show, and a key organizer of the climate art show in the California Adaptation Forum in 2014, among others. Further, she was a peer reviewer and a panelist for the National Science Foundation. Dr. Liu prepared for her endeavors by earning a Bachelor of Science from Northwest A&F University in 1981, a Master of Science from the University of Wisconsin-Madison in 1985, and a PhD from the University of California, Davis, in 1990. To ensure she remained up to date in her fields, she completed coursework in art education between 1989 and 2002 and became a diplomate of the art residency program for bio art at the School of Visual Arts in 2016. In light of her achievements, Dr. Liu received an art award from the Sin-Eco Association in 2008, an honorable mention award from the Sacramento Fine Arts Center in 2007, and a merit award from the WASH Annual Open Show at the Sacramento Fine Arts Center in 2005. She has also been honored with accolades such as a research grant from the National Science Foundation, the Fellows and Distinguished Scholars Non-Resident Tuition Fellowship from the University of California, Davis, the Short Term Enrichment Program Award from the American Institute of Biological Sciences and research grants from the Minnesota Cultivated Wild Rice Council. Additionally, from the University of Minnesota, she earned grant-in-aid of research scholarships, China center research scholarships, project development funds awards, and the Minnesota Sea Grant.